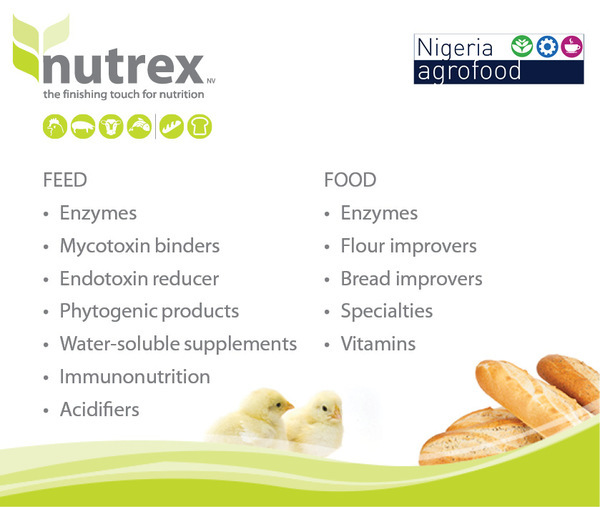 Nutrex is pleased to invite you to AgroFood in Nigeria from March 27 - 29, 2018, Landmark Centre, Hall 2, 2D.1.6 We look forward to seeing you there! NUTREX is a belgian company specialized in the development, production and sales of additives towards the food and feed industry. For the baking and milling industry we produce flour improvers, bread improvers and specialties. We deliver tailor made solutions adapted to your specific flour quality and application. For the feed industry we have a large range of specialty nutritional additives for poultry, swine and ruminants. We provide the finishing touch for nutrition.